Drench with a liquid organic fertilizer when plants begin to bloom heavily. Nasturtium, Lettuce, Radish, Tomato, Dill, Tansy, Marigold, Oregano, Sunflower and Beans. Easily grown from seeds sown directly in the ground, or start seeds indoors and set plants out when they are 3 weeks old. 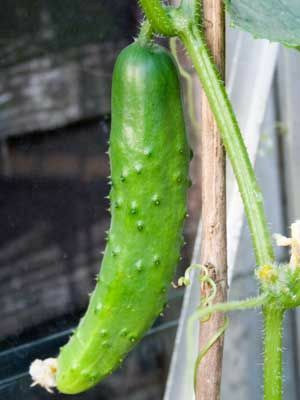 Use a trellis to save space, or you can let cucumbers ramble over mulched ground. Pick cucumbers at least every other day by snipping them from the vine with pruning shears. Many varieties are extremely productive. Fruits with hard seeds inside are overripe. Cucumber beetles transmit an incurable disease called bacterial wilt. Exclude them with floating rowcovers.